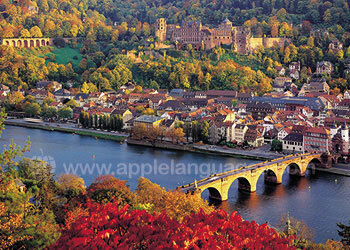 It is difficult to think of a more ‘German’ location in which to learn German than Heidelberg. 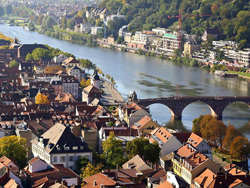 Home to the oldest university in Germany and to thousands of German students each year, Heidelberg is a charming, picturesque town on the River Neckar in southern Germany. 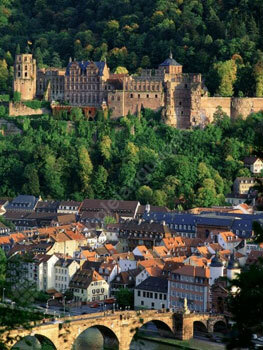 Heidelberg offers an interesting mix of German history and vibrant youth. Its many concerts, festivals and Christmas market attract many visitors each year and are very popular with students taking a course at our German language school. 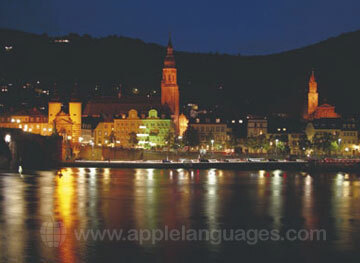 Students who learn German on one of the many courses offered by our Heidelberg school can experience life in this beautiful city, while they learn the German language. 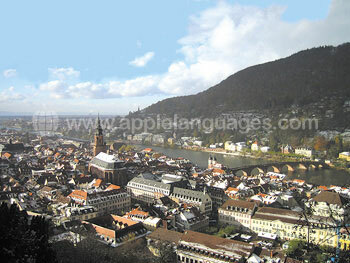 Our German language school is located in the Handschuhsheim area of Heidelberg, just 15 minutes walking distance away from the in the historic centre. This area of Heidelberg is one of the most attractive parts of the city and has beautiful tree lined streets and impressive historic buildings. Our students study in a ‘heritage protected’ building which combines traditional features with modern facilities, including wifi access throughout the building. There are also spacious gardens and a terrace where the school hold barbecues in the summer months. Our school offers a wide range of German courses, including an ‘Intensive’ German course, with 20 German lessons/week, and ‘Super-Intensive’ courses of 25 or 30 lessons/week. There is also an Examination Preparation Course for students wanting to take the Telc or TestDaF exams. If you want to learn as much German as possible during your stay in Heidelberg, we would recommend that you stay in one of our school’s carefully selected German host families. 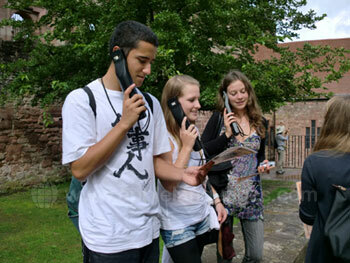 The family will speak German to you, enabling you to get lots of extra practise of the German you learn on the course. Shared and studio apartment accommodation is also available for students in a modern residential block, located in Heidelberg's Bahnstadt district, just a 20 minute tram ride away from the school. The apartment complex has excellent facilities for all residents including a TV-lounge, fitness area and laundry room. Average score for our school in Heidelberg based on 37 previous client reviews. The course was very well organized, with the right balance between theory and practice, and the teachers were prepared to 'take care' of the students. The accommodation was very good, with good tram-bus connections to the city centre, and the host family was absolutely perfect. I really enjoyed the course, and I wish I could have stayed longer than the 2 weeks I had. Our teacher, Angelika, was very good, she made learning fun. I wouldn't hesitate to recommend the school. The family were very nice and made time for me. On my first day they took me into Heidelberg in the evening, showed me where to get the tram, where to buy my ticket, told me how much it would cost etc. And they also showed me where the college was, so I had no problems in getting to the college on my first day. 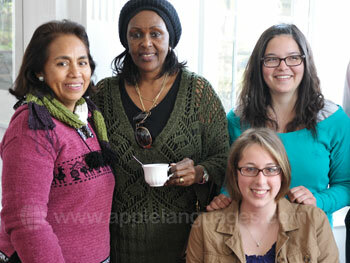 They made time to talk to me (in German) each day, and I felt part of the family. They also gave me a present - a book on Heidelberg. On my last day they took me to the station by car, and stayed with me until my train came. They've said that I must come back to visit. I have to say that the only regret I have having spent a month learning German in Germany is that I wasn't able to stay longer! The course was absolutely amazing... Being part of an international group ensures that there is always an exciting blend of people to interact with, to learn from and ultimately to forge friendships with... 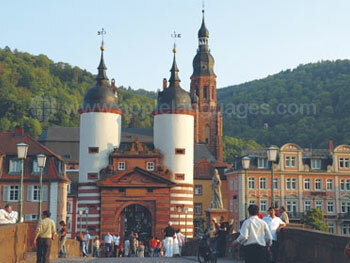 I know that I will keep in touch with many of the people I met in Heidelberg for an extremely long time. I chose to stay in a host family, an experience which I thouroughly enjoyed! When learning a language, I am of the opinion that total emmersion is best, and this is what I experienced in the host family. I had so much fun with Familie Vogelsang... whether I was helping the mother to prepare the meals, laughing over cheesey german soap operas with the two daughters or enjoying the odd beer and football match with the father, there was always fun to be had! The course was taught well. The teaching was directed to my needs and the staff were very helpful. My accommodation was amazing. I couldn't have been luckier in this respect. The family were so welcoming and kind. I probably learnt just as much with them as through the course itself! The course was very good and the teacher very qualified. The accomodation was beautiful and we had a lots of space. The course was good and met my needs. 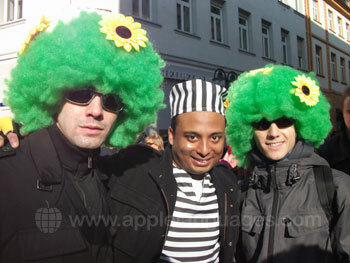 All in all, I had a great time in Heidelberg. I would recommend this to others. Our teacher was really very good! I have to say that the only regret I have having spent a month learning German in Germany is that I wasn't able to stay longer! It was over tears at 6am in the morning after a goodbye party arranged by the students that I finally took my leave. The course was absolutely amazing. Being part of an international group ensures that there is always an exciting blend of people to interact with, to learn from and ultimately to forge friendships with. 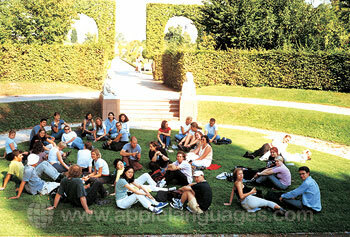 I know that I will keep in touch with many of the people I met in Heidelberg for an extremely long time. I've been invited back to stay at the home of one particular best friend that I made. Seeing as he comes from the french part of Switzerland, I'm sure going back to see him will also be benificial for my french! The teachers on the german course also deserve a mention. They really do ensure that there is never a dull moment and fill the day with a mixture of presentations, texts, role plays and even acting which always captured the interest of the class! And who could argue about the scenery? The picture-perfect surroundings that Heidelberg have to offer really do act as perfect anecdote to the odd hangover that you'll encounter whilst away! I really am going to miss waking up to the view of a thousand winding cobbles streets, old bridges, historic castles and breathtaking woodland! Studying here in Heidelberg really was an invaluable experience which I will never forget, and I am more than 100 percent certain that I will return one day! I chose to stay in a host family, an experience which I thouroughly enjoyed! When learning a language, I am of the opinion that total emmersion is best, and this is what I experienced in the host family. I had so much fun with my host family. Whether I was helping the mother to prepare the meals, laughing over cheesey german soap operas with the two daughters or enjoying the odd beer and football match with the father, there was always fun to be had! I had the most amazing time studying and living in Heidelberg, and I think anyone would have to be crazy not to go for it. My german has vastly improved, both in accuracy and general confidence, and I have made some amazing friends. The life in Heidelberg is so vibrant and so alive that it's completely impossible to come back having not had the most amazing time... I just wish I'd been able to stay longer! The standard of teaching was good. I liked the course a lot. Excellent student accommodation. The tutor was experienced, positive, enthusiastic and energetic. The classes were fun and I particularly enjoyed working with the non-course texts, thanks to the tutor's interest in literature. She explained the grammar clearly and introduced plenty of vocabulary. She was always interested in her students and kept the class very engaged. I enjoyed the excursion and orientation programme, which was very useful. I found the course very useful. My accommodation was very good and with a pleasant family. It was highly valuable to stay with a host family who took time to talk with me in German language every evening for an hour or so after dinner. The course was well led by a very able and enthusiastic teacher. The things we did in class were very interesting and many topics were discussed. I believe my German has improved. The accommodation with my host family was of a high standard. The family were also very nice and friendly. The course was very good- I was in the top class and I felt I was really stretched and complex grammar points were explained very well. The different types of learning material (music, grammar, vocabulary) made the class always interesting. My accomodation was great! I really loved the host family because they went out of their way to make me feel comfortable and to really experience the "German way" of life. The director and teacher were very friendly and helpful, I felt very welcome. This is the second time I have attended this school. I particularly enjoy the ability of the staff to impart information on German culture, history etc. as opportunities arise in grammar, lessons and conversation. The lessons were useful and I felt like I learnt a lot. The accommodation was excellent. Small group numbers are ideal for language learning as students feel comfortable asking grammer questions etc. I enjoyed living with a host family, as I was constantly speaking German with my GastMutter and other international students. I really enjyed my 4 weeks, and I met a lot of new people, with different backgrounds and from different cultures but all with the same goal. In just two months I have learnt a lot! The teacher was very professional and kind.